David Kushner. 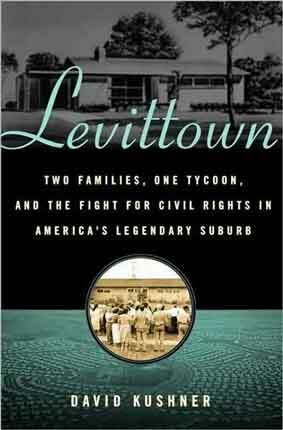 Levittown: Two Families, One Tycoon, and the Fight for Civil Rights in America’s Legendary Suburb. New York: Walker Publishing Company, Inc., 2009. Photographs, index. Pp. 237. ISBN: 0802716199. $26.00. In American popular culture, the 1960s have come to be identified as the seedbed of civil rights for African Americans, as well as other people of color, women, gays and lesbians. In particular, Lyndon Johnson’s acknowledgement of the rights of minorities, the poor, and the underserved led to a spate of policies and programs designed to rectify the exclusionary practices of the past, and to expand the promise of the American Dream to all of its citizens. David Kushner’s tale of “two families, one tycoon and the fight for Civil Rights” in the Levittown of southern Pennsylvania reminds us that the movements of the 1960s had earlier roots. Although ostensibly a study of Levittown, Kushner’s book is less about Levittown than about America and the spirit of radical change that emerged in the postwar era, setting off the ideological battles that would erupt as a domestic cold war. His Levittown is a microcosm of the stirrings of justice and the concomitant fight to overturn the racial status quo in housing in the North; a fight that predated the Great Society by over a decade. The book tells the story of how two young couples – one Jewish and one African American – challenged not only the restrictive racial covenant that Levitt & Sons had incorporated into their leases, but the mindset and attitudes the restrictions represented. The covenant mandated that the premises were “not to be used or occupied by any person other than members of the Caucasian race.” The residents of Levittown expected their neighbors to abide by the mandate, and became violent when it was challenged. The “tycoon” was William J. Levitt, the builder of three Levittown subdivisions in the NY, NJ, and PA regions. Even after the courts ruled against him, his obstinacy in maintaining the restriction in his housing projects fostered the aggressive behavior of the residents. Levitt was not alone. Banks precluded women, workers, and minorities from ready access to mortgages. The FHA incorporated similar restrictions in their policies in the belief that integrated subdivisions would be financially unstable. The block-busting of many real estate brokers and investors drove frightened homeowners to sell below market value to protect themselves from the threatened loss of value of both their houses and their neighborhood, thereby inflaming the fears that fed the violence. The “two families” of Kushner’s title were second-generation non-conformists, one Jewish and Communist; the other, upwardly mobile and African American. Flush with the victories of war and self-consciously aware of their nation’s new role as leader of the free world, this small part of the generation that Tom Brokaw has dubbed the “greatest” optimistically embraced the new, mass-produced suburbs and the promises they offered. In their quest for justice, they found themselves part of a subculture of activist groups and networks that had worked to challenge injustice since before World War I. Their ultimate success in integrating Levittown did not come without much pain and stress, which is the story that Kushner tells. And it is a story. Kushner’s narrative has all the elements of a traditionally thrilling tale: the good guys – timid and unsure – who rise to heroic heights despite overwhelming odds, and the villains who wage unceasing battle against them. Written in a casual, accessible style, the book is at its best when recapturing the domestic lives of its protagonists, showing them to be not so much militant crusaders as people who are forced to live up to their beliefs, regardless of cost. In his passion to demonstrate the evils of American apartheid, however, Kushner tends to lose his objectivity and demonize or caricature his villains. The “big fat bully” is the son of the “hulking, flat-topped haired” community leader with the “beefy arms.” The leader’s friend and fellow agitator is repeatedly described as being “thin and short” with “sharp features [and] a cigarette dangling from his thin lips.” Similarly the leader – and his “cronies” – “rant and incite” the crowd which in turn “hoots and hollers” in derision of the newcomers. There is no such dramatic language surrounding his protagonists. No mention is made of the relative thickness of the body, arms or lips of his protagonists. While good description enhances storytelling, it is important to retain a balance, a level of objectivity, particularly in the two fields this book is straddling – history and journalism. In setting his Levittown narrative into its context, Kushner provides a brief summary of Levittown’s history. In so doing, he occasionally conflates the details of the history of Levittown, its inhabitants, and its developers, into a single paragraph, leading to several minor errors of fact. For example, he repeats the legend of the golden nematode in which the farmers sold their unproductive lands and headed east, but omits the fact that Levitt built the first 2,000 units on undeveloped lands that they had been buying from the Merillon Corporation, since the mid-1930s. Similarly, Kushner’s description of the flawless planning and construction of the Pennsylvania Levittown echoes Levitt’s own press releases and ignores the legal and zoning problems they encountered as well as the problems that arose from his use of inexpensive and substandard materials, such as tarpaper composition sewer pipes. Residents of the various Levittowns and those who have studied them will recognize these inaccuracies. Nevertheless, there is a truth that rises above mere facts and it is this sort of truth that Kushner is writing. Despite these few caveats, the book offers a readable introduction to a time and place in American history when the status quo was being challenged by those who had previously had little or no voice in its establishment. Read it for the tale it offers, for the insights into a period of history that has often been romanticized into a combination of Ozzie and Harriet and Father Knows Best, rather than as a history of Levittown. And read it as a tribute to the two families who held up in the face of brutal harassment by their neighbors.